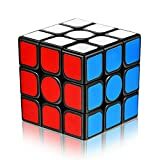 The best speed cube : How to choose it ? 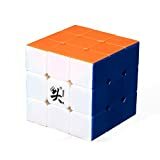 1 How to find the best speed cube 3x3 ? 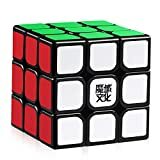 How to find the best speed cube 3x3 ? As many other speedcubing champions would agree, there is no best speed cube. Whilst all speed cubers agree that some Rubik's cubes are not good, ultimately the best speed cube is completely subjective. Essentially, my favorite Rubik's cube 3x3 may not be the favourite of other speed cubers. 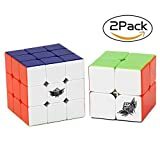 In the following, I aim to give you all the important factors so that you can determine which Rubik's cube 3x3 is the best speed cube for you. 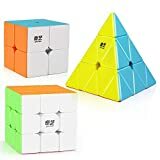 In case you are looking for a gift, I will also tell you which one is the best speed cube for beginners. This would be a 3x3 Rubik's cube that is very smooth and easy to rotate and is also perfect for a gift. 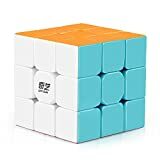 As I said before, there is no universal best speed cube, however it is important to be able to compare them, to determine which is the best for you. We are going to compare the main characteristics of a speed cube. For each characteristics, I will tell you how speed cubers like it and how it may differ in the speedcubing world among cubers. I am going to introduce them in detail so that you have every option to make the best choice. If you want to buy the Rubik's cube now, please have a look at our top 5 of the Rubik's cube 3x3 on the market. The key to good improvement is to have a great Rubik's cube. Of course, practice is vital, however the perfect cube for you will make it much easier. The three best qualities to look for in a 3x3 cube are the corner cutting, the speed of consecutive moves and the unexpected lock-ups. These are the main characteristics to look at when you decide to buy a Rubik's cube. The following four are secondary characteristics and should also be considered: The tension of the screws, the lubrication, the stickers and the size. All these secondary qualities, however can be improved and are variable. Corner cutting is the maximum angle at which the cube can be turned, without lock-up and the cubes being directly aligned. Most of the 3x3 speed cubes I have tried have a 45 degrees tolerance. It means that even if the face is not correctly aligned when initiating the rotation, the 3x3 speed cube will correct the angle itself and allow the rotation. If this does not occur, it can cause a lock-up or even worse; a cubie explosion, which is called a pop. 45 degrees is usually the minimum needed to complete a rotation, however the authentic 3x3 Rubik's cube does not have such a tolerance. If you are looking for cubes with more than 45 degrees tolerance, I would recommend improving your precision in the moves. I do not think that such a tolerance is necessary. The speed cubes that allow more than 45 degrees are also usually slower than the competition. Depending on the angle you are when initiating the rotation, some cubes need more strength to be turned while others will cope up easily and allow you to turn it smoothly. The best speed cubes will tolerate an imperfect alignment and allow you to do the turn with no extra-strength. The speed cube will correct the problem itself. Bad speed cubes will either lock up dramatically or require more strength while turning depending on the angle. Both these factors are problematic for speedcubing and should be avoided. They will both penalize the speed cuber by increasing the solve time. The Dayan Zhanchi is for example a good choice for a speedcube. That's why it's an all time bestseller on Amazon. Just look at how many reviews it has on Amazon, and you will know i'm right. The best speed cubes can be classified into two main categories. The fast speed cubes and the smooth speed cubes. Each category has its advantages and drawbacks. Every speed cuber usually prefer one category or the other. The Rubik's cubes that turn slightly slower are usually referred to as smooth. This is because of the very enjoyable turn that necessitate almost no strength. It is a real pleasure to use a smooth speed cube. Whilst they may turn slightly slower, the tolerance on the rotation is usually great, which allows to never get stuck or waste time, essentially making up for the wasted time in the slow rotation. This is a very efficient cube, though not the fastest one. The smooth speed cube is personally the kind of speed cubes I prefer. It is because of the style I have when solving the Rubik's cube: pretty slow but I try to be extremely smooth. This method typically results in no lock-up and no waste of time. Therefore, it is naturally the kind of speed cube I would recommend. If you are interested, a great smooth cube can be viewed on the following link. The speed cubes that turn extremely fast allow to perform Rubik's cube algorithms in a record time are simply called a fast cube. Although it has a fast rotation, it requires perfect precision from the speed cuber. They offer more power, but more precision is needed to avoid lock-ups, which can be caused with simply just a few millimetres of inaccuracy. If you feel like you have enough experience and knowledge, feel free to give it a go! Anyway, if you want to acquire a very fast speed cube, i highly recommand this one below, which is magnetic. There are many reasons why a speed cube can lock-up during a solve. Every speed cube that can easily lock-up should be avoided. Sometimes, some speed cubes lock-up with no obvious reason. These are unpredictable and can be very frustrating. Specially when you are about to break your personal record! If you experience lock-ups because the speed cube is not tight enough, remove the center caps and tighten the screws. This should eliminate any kind of lock-ups. If you don't want to mess with your cube, just go for the one below. The perfect tension for a speed cube depends of the taste and the style of the speed cuber. It's a compromise to find between fast, precision required and frequency of pop out. 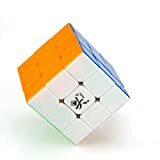 I do not recommend to choose a speed cube that pops out easily. In my experience, I have noticed that when at a competition incorrect tensions has resulted in loss of precision in the moves. Although lack of precision is caused by the pressure of the competition, less precise moves will increase the chances of pops and ultimately cause wasted time. A cube that is too tight will not be comfortable. At every move, the speed cubers will need more strength and therefore the turn will be less precise. If you use regularly the same 3x3 speed cube, it will improve with time. The plastic edges will be rounded which will allow easier rotations. The lubrication of the 3x3 Rubik's cube is very important. Every speedcuber uses lubricant regularly to improve the quality of his speed cube. The most used type of Rubik's cube lubricant is made of silicon. The silicon is a good match with plastic and it lubricates the Rubik's cube perfectly. Some silicon-based lubricants are more liquid, some others are more solid. The best speed cube lubricant usually depends on both the style of the speed cubers and the plastic of the speed cube. I have even seen some speedcubing champions mixing 2 different lubricants for the perfect lubrication. The most common sizes of the 3x3 speed cube either have a 4.2cm, 5.5cm or 5.7cm side. Some of them are much bigger or much smaller though. 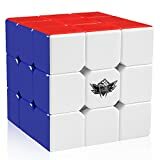 Larger and smaller cubes can not be used for speedcubing because they are much more difficult to turn quickly, however when not used for competitions, they are equally as fun. The common speed cube has 5.7cm sides. Some speedcubers have smaller fingers and therefore would prefer 5.5 cm cubes or even 4.2 cm cubes. 4.2cm cubes are always the preferred size for one handed solving. My advice is that you try and choose what is the most comfortable to hold. Without stickers and with built-in colored sides, the Rubik's cube is much easier to solve... But a lot less interesting ! 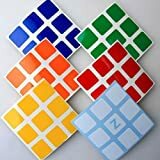 Z Stickers for 5.7cm 3x3x3 Speed Cubes . A Set of High Quality Stickers for Replacement . Standard Bright. Most of the speed cubers are usually used to a given set of colors. Changing the color scheme is very difficult and needs a lot of practice to catch up. Also the best stickers on a speed cube usually have very different colors. This allows you to quickly differentiate the colors and not to waste any time on wrong color shades. Shiny colors are usually preferable because they are easier to spot and differentiate. To know everything on the different speed cubes, have a look at our page which tell you which Rubik's cube to buy.